The following text about the vision Pope Leo XIII had on the Devil and the challenge he made to God came to my attention. I imagine that you would like to know it and, perhaps, pass it on to your readers. Regarding the origin of the St. Michael prayer, this report comes from an eyewitness account published in the Italian journal La Settimana del Clero in 1947. “I do not remember the exact year. One morning the Sovereign Pontiff Leo XIII had celebrated the Holy Mass and, as usual, was attending another Mass of thanksgiving. Suddenly, I saw him raise his head energetically and stare at something above the celebrant’s head. He had changed; he was staring motionlessly, without blinking, with an expression of terror and astonishment. Something unusual and grave was taking place. “He answered: ‘No, nothing.’ Later he would comment, ‘I have seen devils and heard their grunts, blasphemies and mockeries. I have heard the awful voice of Satan challenging God, asserting that he could destroy the Church and take everyone to Hell if he were given enough time and power. Satan asked God to give him 100 years to influence the world more than he had ever influenced before. He also saw St. Michael appear and cast Satan and his legions into the abyss of Hell. “The Pope closed himself in his office and, after about a half an hour, he called for the Secretary of the Congregation of the Rites. Handing him a paper, the Pope ordered that it be printed and sent to all the diocesan Bishops around the world. On that paper the Pope also ordered that those prayers be said keeling. His words, which were published in the periodical The Week of the Clergy on March 30, 1947, does not quote the sources for this news. Nonetheless, this was the origin of the extraordinary way those prayers were ordered to be prayed by all diocesan Bishops in 1886. “Leo XIII himself wrote the prayer. The sentence ‘the evil spirits who wander through the world for the ruin of souls’ has a historical explanation, which was repeated many times to us by the Pope’s private secretary, Msgr. Rinaldo Angeli. Leo XIII truly saw in a vision the infernal spirits who were congregating over the Eternal City [Rome]. From that experience was born the prayer that he ordered the whole Church to pray. He himself would pray it with a strong, vibrant voice. We heard him say it many time in the Vatican Basilica. First, thank you so much for your fine website which, here in England, I see daily. I want to comment on your piece about school uniform and to say how much I agree with you. I was a head master of Catholic schools here in England for twenty-four years and have also experience of inspecting schools. School uniforms, which are almost universal in England, give children a sense of pride in their schools (as a sporting kit gives them pride in their team). The uniform prevents needless competition wearing whatever the commercial shops have decided is the latest fashion; a uniform indicates that all the pupils are equal, not in any absurd egalitarians sense, but at a deep level: I used to say that our school pupils were different in just about every way, but within the school they were equal in importance to us. Further, a uniform prevents the financial background of the pupils being obvious: rich and poor wear the same uniform. Finally, a uniform actually saves money for parents because the pupils are not constantly looking for something different. In England, just about every independent school (i.e. 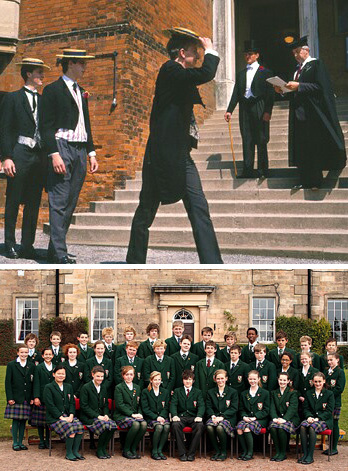 fee-paying school) has a uniform: some of them traditional such as those of Eton and Harrow and the great Catholic Schools such as Stonyhurst, old school of Conan Doyle. In the state sector, there was a move by the socialists who control so much in England nowadays, to abolish uniforms. But the parental reaction in favour of uniform was so strong that even most state schools now have a uniform. As a headmaster, to the day I retired I wore my academic gown for assemblies and for my teaching. The teaching staff did not wear academic dress daily, but did on occasions. Your website is very edifying and, I am sure, does much good. Keep up your good work. Thank you for your kind words about our work, and your interesting comments on the uniform system in Great Britain, which we will post in our Comments section. I was most interested to hear that even the public school parents are proponents of them. Thank you for this very prompt and kind reply. I just correct one tiny point in what you say. In England the private schools are known as “the public schools”; yes, this is what we do in England. So, Eton, Harrow, Winchester, Stonyhurst are all fee paying (with high fees since they are boarding schools) but are known as “public schools”. The term came in during the 18th century to distinguish the great traditional schools from the less distinguished “private” schools. One refers to the Prime Minister, for instance, as having a “public school accent” meaning he has had an expensive education – in his case, at the most famous school of all, Eton. Little else can be said in the man’s favour, I am afraid and he can hardly claim to be Conservative. Our eldest son was at Oxford with him: same college (Brasenose); same year; even the same stair-case. England has several of these linguistic anomalies: at a sporting event, if one wants to sit down, one goes in the stand; in the House of Commons, all members may speak in the debates except The Speaker. If I can ever do anything for you over here, please let me know. I admire very much what you are doing: the Church needs so much her own traditional values.